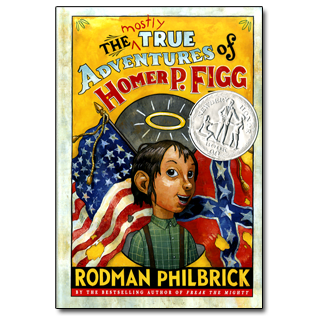 August's Children's Book Club selection was The Mostly True Adventures of Homer P. Figg by Rodman Philbrick. This funny, engaging, suspenseful, action-packed novel was a 2011 Newbery Honor Book. And for good reason. The tightly-woven story about a young boy seeking his older brother follows an interesting path. The narrator tends to lie...well, he says he's just telling stories and making the truth more interesting. Following this somewhat unreliable narrator on his journey to find his brother (and happiness) is very fun. "Philbrick (Freak the Mighty) offers rip-roaring adventure in this Civil War–era novel featuring a mistreated orphan who doesn't let truth stand in the way of spinning a good yarn. When his guardian, Uncle Squinton—the meanest man in the entire state of Maine—sells off Homer P. Figg's older brother, Harold, to take a rich man's son's place in the Union army, Homer can't just stand around doing nothing. Determined to alert the authorities (and his brother) that Harold is too young to be a soldier, the plucky narrator traces the path of the regiment. He faces many dangers, including an abduction or two, and being robbed and thrown in with the pigs, and joining the Caravan of Miracles before landing smack in the middle of the Battle of Gettysburg, where he reunites with his brother and more or less drives the Confederates away. The book wouldn't be nearly as much fun without Homer's tall tales, but there are serious moments, too, and the horror of war and injustice of slavery ring clearly above the din of playful exaggerations" (Publisher's Weekly). This month's Book Club pick was very well liked. One of the members thought that the beginning of the story was a little slow but "it got way better! 5 1/2 out of 5 stars!" Another club member said that the book is "funny. The beginning was slow. Overall, it was a great book. The beginning needed more detail and excitement. 4 1/2 out of 5 stars!" September's Children's Book Club selection is The Lemonade War by Jacqueline Davies. I look forward to seeing you all there! And please stay tuned for details on another Book Club which will be starting after the start of school!